The Ord River Catchment lies within the Kimberley Region of Western Australia, which enjoys a sub tropical climate with marked wet and dry seasons. It covers an area of 46,100 square kilometres. From its source the Ord River, meanders 650 kilometres through the Traditional Lands of the Jaru, Kija, Mirriuwung and Balangarra people towards the Cambridge Gulf and ultimately the Timor Sea. The main tributaries of the Ord are the Behn, Negri, Nicholson, Dunham, Bow and Panton Rivers. The Ord River is one of six major river systems in the Kimberley. Before its natural seasonal variations were interrupted by the construction of the Kununurra Diversion and Ord Dams, the length of the great river swelled across flood plains in the tropical wet season and dried into water holes during the dry season. Below the dams, it now flows continually. The Ord River Catchment is spanned by the Shire of Halls Creek and the Shire of Wyndham East Kimberley. Settlements within the Catchment include three towns and approximately twenty Aboriginal Communities. Halls Creek lies in the upper reaches, Kununurra on the banks of Lake Kununurra and Wyndham on the Cambridge Gulf into which the Ord River flows. Warmun Aboriginal Community lies between Kununurra and Halls Creek and the smaller Aboriginal Communities are nestled in the ranges around the Catchment. The main industries in the Catchment are irrigated agriculture, the pastoral industry, tourism and mining which are all underpinned by the natural resources of the area; the magnificent topography, wealth of minerals, fertile soils and water. The Ord River Irrigation Area (ORIA) Stage 1 was established with the construction of two dams; the Kununurra Diversion Dam in 1962, which formed Lake Kununurra and the Ord Dam in 1972 which permitted Lake Argyle to form over the 1972/1973 Wet Season providing a water supply for an irrigation project of more than 50,000 hectares and the opportunity to establish the 30MW Ord Hydro Scheme in 1996-1997, that supplies electricity to Kununurra, Wyndham and the Argyle Diamond Mine. Designed in the late 1950s, the irrigation system was constructed to take advantage of what, at the time, was thought to be abundant supplies of water to flush the system, ensuring no build up of farming residues within the irrigation area. A network of channels fed, by a single main channel, delivers water to farms and an extensive drainage system, including large trunk drains, removes excess irrigation and wet season flood water from the farms. Hillside drains are located around the perimeter of the system to protect the internal channels and drains from large wet season stormwater flows. Stage 1 of the ORIA comprises 14,000 hectares land on the Ivanhoe Plain, mainly cracking clay soils of the Cununurra series. Areas between the main plain and river are sandier soils of the river levee bank and the Pago and Cockatoo sands lie between the plain and nearby hill systems. Some areas of very heavy Aquitane clay soils are located on the flatter margins of the main Ivanhoe Plain. A further 2,000 hectares of land on the Packsaddle Plain includes most of the soil types found on Ivanhoe Plain as well as significant areas of medium textured red clay soils of the Packsaddle type. More than 60% of the ORIA is underlain with sand and gravel beds of the old (Palaeochannel) bed of the Ord River. These sand and gravel beds conduct water well and form extensive interconnected aquifers beneath the irrigated areas of both Ivanhoe and Packsaddle plains. The water in these aquifers is generally low in electrical conductivity (indicating low levels of dissolved salts), with a few localised exceptions. Further to extensive cropping trials throughout the 1940s and 1950s, the initial irrigation farming system on the Ord was based on cropping cotton over the wet season. Farms of approximately 240 hectares were released in the early 1960s. The majority of farms were made up of three irrigation bays of approximately 80 hectares each. Farms were serviced with irrigation supply points and drainage outlets as required and development conditions were placed on the farms to encourage rapid development of the irrigation land. From 1962 to 1974 cotton was the mainstay of the irrigation area, although many crops were tried both experimentally and on farm. The area under crop during this period peaked at a little more than 7,000 hectares. With the closure of the cotton industry in 1974 a period of restructuring continued throughout the 1970s to mid 1980s. During these years the area under crop declined to less than 3,500 hectares and a wide range of crops was tested experimentally and on farm for suitability. Many of the crops that showed early promise (rice, grain sorghum, peanuts, hay, millet and others) later failed because of poor yields, poor quality or poor prices. Towards the end of the 1980s horticulture was introduced and crops that could generate large profits, including melon varieties and pumpkins, became the norm. Cucurbit crops grown for the domestic market out of season with the southern temperate supplies and bananas that were grown for the Perth market enabled new farmers to become established. Profits from these high value crops enabled other crops such as sugarcane to be grown and resulted in all the available irrigation land being brought into production. In 1995 the Ord Sugar Industry was established with the construction of a small sugar mill and export of molasses via Wyndham Port. Also from 1995, trial genetically modified cotton was grown, as part of a program to develop counter-cyclical production using integrated pest management strategies. The area of cotton grown reached almost 1,000 hectares in 1999. By 1998 more than 12,000 hectares of land were harvested and the range of crops included leucaena for cattle pasture, hybrid seed, grains including chickpeas, borlotti and cannellini beans, maize, sunflowers, horticulture crops including rockmelon, watermelon, pumpkin, bananas, mangoes, zucchini, squash, onions, tomatoes and beans. In 2007, low global sugar prices and the sub-economic scale of the Ord Sugar Industry resulted in its decline and components of the Sugar Mill were sequentially sold. Approximately 100 hectares of sugar cane has been maintained in the area as plant stock for a future sugar industry. The demand for new farming land led to proposals to develop the second stage of the ORIA including more than 30,000 hectares on the Weaber, Knox Creek and Keep River plains to the north and east of Stage 1. This “M2 area” was subject to extensive study by a consortium made up of Wesfarmers, Marubeni Corporation and the Western Australian Water Corporation, in the late 1990s, with the aim of establishing a large-scale sugar industry. Additional potential development areas north west of Stage 1 included more than 10,000 hectares of the Carlton Plain and Mantinea areas of the lower Ord River. Wesfarmers Marubeni withdrew its proposal to develop the M2 area in 2001. On 6 October 2005, two years of Ord global negotiations to settle the Mirriuwung Gajerrong Native Title Claim, culminated in the Ord Final Agreement (OFA) a comprehensive Indigenous Land Use Agreement between the Mirriuwung Gajerrong (MG) Traditional Owners and the State Government that settled a ten year old Native Title Claim. The Ord Final Agreement provided the pathway for the release of land for the development of Ord Stage 2 that would double the size of irrigated agricultural land in the Ord Valley and provided a comprehensive benefits package to the Mirriuwung Gajerrong Traditional Owners. This package included socio-economic benefits and the opportunity to participate in the agricultural development through skills development, employment and agricultural land acquisition. The Ord East Kimberley Expansion Plan was developed and implemented through a State and Commonwealth Government National Partnership Agreement, signed by the Prime Minister and Premier of Western Australia in Kununurra on 3 July 2009. The Ord East Kimberley Expansion Project ($517 million) comprised irrigated agricultural land expansion (funded through the Royalties for Regions program) and concurrent community and social infrastructure development (funded by the Commonwealth) A Ministerially appointed Community Reference Group, comprising Growers and Community and Government Leaders, provided input into the development and acted as an information conduit between Government and the Community. The four year project was completed in 2013. The development of the Goomig Farm Area (7,400 hectares) was progressed over a four year period and comprised a 21 kilometre extension of the M1 Channel, off farm irrigation and 70 kilometres of drains and drainage infrastructure and a 26 kilometre road extension. The Goomig Farm Area was designed to include a recyclable largely automated irrigation system, a buffer zone and wildlife corridors. In addition, Knox Plain comprising 6,000 hectares adjacent to the Western Australian border with the Northern Territory, was allocated for development and 6,000 hectares of Cockatoo sands distributed to the north east of the ORIA identified for potential development. The Northern Territory (NT) Government is also progressing plans for an initial 14,500 irrigated agricultural land development on the NT side of the border that will potentially use water from the Ord River. There are more than 100 active farms in Stage 1 of the ORIA, however more than half of these are small and rely on off-farm income.. Approximately 40 are large-scale irrigation farms on which a range of crops is grown. Of these farms most are used to grow a diversity of crops in any one cropping year. The large farms are irrigated using surface flow irrigation in furrows, while more intensive tree crops, small crops and bananas are grown on the sandier soils and are irrigated using a range of sprinkler and tape systems. The successful proponent for the development of the Goomig Farm Area has progressively cleared and established on-farm irrigation and drainage infrastructure since 2013, with first crops grown in 2015. In 2016 over 1,600 hectares of Goomig Farm lands were cropped with chia, quinoa and maize, with an expectation that 4,000 hectares would be cropped in 2017. The Sandalwood Industry, that was initially based on managed investment, soon became and continues to be a prominent industry in the Ord River Irrigation Area. Sandalwood is also grown at Kingston’s Rest, 100 kilometres to the south of Kununurra, and irrigated from the Dunham Diversion Dam. The first trees have been harvested and shipped to Mount Romance in the South West of the State for processing and oil extraction. The oil is subsequently exported for use in the pharmaceutical and cosmetic industries. In 2016 the main crops grown other than Sandalwood continue to be a range of high value commodity crops including: chia which is high in nutrients, borlotti beans, chickpeas, maize, sorghum melons, mangoes and a recent addition; quinoa. The establishment of the Northern Australia Crop Research Alliance in 2016, by growers in partnership with the Department of Agriculture and Food WA at the Department of Agriculture and Food WA Kununurra Research Facility, plans to undertake research into new cropping options including pulses, ancient grains (for example: quinoa and teff). Following settlement in the 1880s, cattle numbers in the East Kimberley expanded rapidly, sustained by an abundance of surface waters and productive pastures. Station infrastructure (for example, fences and artificial water points) was meagre and cattle control was limited to minimal manipulation of numbers on a broad scale, with virtually no control over where cattle concentrated. By the 1930s the dramatic increase in grazing pressure from cattle and feral donkeys, compounded by the effect of bushfires, was sufficient to exceed the resilience of the country (specifically parts of the Nelson, Gordon, Antrim and Elder land systems). Large areas became degraded and eroded. The majority of the eroded country occurred on the Ord River, Turner and Flora Valley Stations in Western Australia. However, a significant contiguous area also occurred on Mistake Creek Station in the Northern Territory in the catchment of the Negri River, a major tributary of the Ord. Erosion of the friable, calcareous soils of the area contributed enormous sediment loads to the Ord River and it was later recognised that this had the potential to silt up the reservoir of the proposed dam for the Ord River Irrigation Scheme. 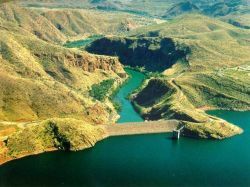 Although erosion in the Ord River catchment was described in the 1940s (Medcalf 1944, Teakle 1944), it was not recognised as being a problem of sufficient magnitude to warrant remedial action until plans to dam the Ord River were conceived. At the time the sediment load, estimated to average about 29 million tonnes per annum at Coolibah Pocket near the site of the present Ord Dam (Kata 1978), was considered a sufficient threat to the long term storage capacity of the dam to necessitate a stabilisation program on the most severely eroded parts of the catchment. 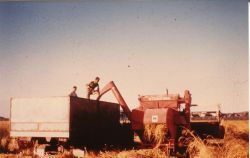 The regeneration project was commenced in 1960 by the Western Australian Department of Agriculture operating initially from a field camp on Turner Station and later from a base established on the Ord River Station. In the late 1960s a second depot, Fox River Station, was established in the south of the project area on land previously included in the Flora Valley Station lease. The project commenced under a co-operative arrangement with station lessees. However, the arrangement did not prove workable and in 1967 Ord River and Turner Stations and parts of the Flora Valley, Ruby Plains and Elvire Stations, were resumed by the State Government and the area was gazetted as a Water Catchment Reserve. In 1987 a large part of the area west of the Ord River (which was not badly degraded) was established as the Purnululu (Bungle Bungle) National Park and Conservation Reserve and was managed by the Department of Conservation and Land Management. The regeneration program began in 1960 and concentrated on the severely degraded parts of the Nelson land system. Under an agreement with the Northern Territory Administration, the Western Australian Government also carried out rehabilitation work on adjacent country in the Territory. A fencing program commenced in 1960 on a large area known as Turner Plains and progressed until about 1968, dividing the project area into a number of large paddocks. Initial mustering to destock paddocks was undertaken by station lessees. However, after resumption of the leases, subsequent mustering and destocking was facilitated by the Ord River Dam Catchment Area (Straying Cattle) Act 1967 and amended in 1969, which vested ownership of all cattle within the Regeneration Reserve to the Crown. Contract musterers and Department of Agriculture staff operated and turned off cattle in most years, until the mid-1990s. The regeneration program involved destocking, eradication of donkeys, contour cultivation and seeding those degraded areas that were accessible to machinery. Cultivation was carried out using tractor-mounted implements, specifically 5 to 7 tyne chisel ploughs, opposed disc ploughs with centrally mounted rippers and disc pitters. All cultivations were carried out on the contour, with contours being marked using a mobile hose level. The contour cultivations were in discontinuous parallel strips about 3 metres wide and usually separated from each other by 5 to 10 metres of uncultivated ground. Seed boxes were mounted on the tractor or cultivating implements and the introduced species kapok bush (Aerva javanica), buffel grass (Cenchrus ciliaris) and Birdwood grass (C. setigerus) were seeded together. Cultivation works and seeding continued at various levels of intensity from 1960 until the mid 1980s. Many areas were treated more than once, some three or four times. Repeat or ‘follow-up’ work involved strip cultivation, sometimes without seeding, between the lines of the original cultivations. Additional methods of regeneration such as the construction of large banks for water ponding and water harvesting, spreader sills, check banks and small gully control structures were tested during the course of the project. By 1974 it was considered that parts of the Regeneration Reserve had recovered sufficiently to be used as a research centre for a series of cattle grazing and management trials. These trials clearly demonstrated the advantages of weaning and Brahman infusion to the pastoral industry (Pratchett and Young 1989, Pratchett et al. 1989), but at the same time highlighted the fragility of the vegetation cover and the great difficulties of managing a complex mixture of recovered and still partly degraded country. Grazing management studies in the Regeneration Reserve concluded in 1995. In its present form, the project area is managed by the Department of Parks and Wildlife as a water catchment reserve. Management activities include the maintenance of perimeter and internal fencing, grading of access tracks, aerial burning early in the dry season to control wildfire hazards, and the removal of stray cattle, donkeys and camels. Recovery within the project area has been described by Fitzgerald (1968), Ryan (1981) and de Salis (1993). Eight years after the commencement of the program of works, Fitzgerald outlined how the project had been beset by difficulties in the early years, due mainly to a series of adverse seasons and an inability to exclude stock from the areas under treatment. However, following completion of the fencing program and two good seasons (1966/67 and 1967/68) Fitzgerald considered that the whole area showed a marked improvement in vegetation cover. Ryan considered that there was much observational and some quantitative evidence (Ryan and Payne 1976) that treatments had been effective at improving ground cover and reducing soil losses. Kapok bush had proven to be an excellent coloniser of bare ground, buffel and Birdwood grass had established widely and in the absence of grazing, native grasses had recovered. Ryan considered that the large gully systems on the lower slopes of the Nelson land system had all shown some stabilisation. De Salis (1993) reported that by 1981 the regeneration program had re-established vegetation on most of the previously degraded areas. Recovery was enhanced by a run of good seasons from the mid 1970s to the early 1980s. However, condition assessments (1981 data) showed that the rehabilitation process was not complete and that the Regeneration Reserve continued to have the capacity to contribute large amounts of sediment to Lake Argyle. Internal reviews by the Department of Agriculture in the mid 1980s and in 1990 highlighted concerns that sediment loads of the Ord River were still unacceptably high. With successful regeneration evident on the upper slopes the reviews considered that the majority of sediment entering the dam may originate from gully extension, widening and deepening. Gully control measures were tested on a small number of gullies with reasonable success but were not applied as a broad scale treatment because the cost was considered prohibitive. Since 1990, observational evidence suggests that vegetative cover has continued to improve considerably throughout the project area, but there is no quantitative information concerning gully stabilisation. Good or very good seasonal conditions during most of the 1990s have driven the recovery. Changes on the Nelson and Gordon land systems since 1960, have generally been remarkable with profound vegetation changes in terms of botanical composition, species richness, plant density, biomass and to a lesser extent, vegetation structure since the early 1960s when the project was in its infancy (Payne 2002). Recent observations and prior knowledge suggest that there have also been marked improvements in soil surface conditions over much of the project area. High perennial grass densities, high levels of standing biomass and abundant litter provide protection to soil surfaces. Cryptogamic soil crusts are well developed and widespread. Gently sloping interfluves of the Nelson land system, which were previously widely micro-terraced and sheet-eroded, are now mostly stabilised by ground cover. Most large gully systems on interfluve lower slopes of Nelson are stabilised or partly stabilised by dense grass and shrub cover extending right to the edge of gullies and established in gully floors. One of the largest and most spectacular areas of recovery of the Nelson land system is on Turner Plains (approximately 170 square kilometres) in the centre of the Reserve area. Many parts of the Gordon land system that were actively eroding in the 1960s and 1980s are now stabilised by ground cover. Recovery on the frontage plains unit is particularly dramatic, with stands of the introduced Cenchrus spp. grasses and native perennial grasses such as ribbon grass (Chrysopogon fallax) and shrubs providing dense ground cover and abundant biomass. The alluvial plains unit of Gordon still includes some bare scalded tracts up to a few hundred metres in extent. These areas have hard setting, sodic clay soils which provide challenging habitats for plant establishment and are not responsive to conventional treatments for example, contour ripping or furrowing. However, water ponding undertaken in the 1970s and 1980s has successfully ameliorated soil conditions and enabled fair to good stands of perennial grass to establish in most affected areas. Fencing as an aid to mustering and controlling the location of cattle and controlling cattle grazing pressure. Progressive reduction of grazing pressure by cattle to near zero. An estimated 143,000 cattle were turned off between 1961 and 1990 (de Salis 1993). Present cattle numbers are negligible. Removal of feral animals, particularly donkeys. The total number of donkeys destroyed since the project commenced is unknown but from 1979 to 1981 the Agricultural Protection Board claimed 15,138 donkeys shot from helicopters (de Salis 1993). Present donkey numbers are negligible. Treatment of degraded country over many years by the cultivation of niches for plant establishment and the introduction of perennial plant seed. Buffel and Birdwood grass and kapok bush emerged as key components of the revegetation work. For most years of the last decade, rainfall on the Reserve has been well above the average, a situation which was a major driver of the observed changes. As the plant communities on the Reserve are now dominated by long-lived perennial species, a return to a more normal rainfall pattern is unlikely to reverse the recent trends in the condition of the soils and vegetation in the Reserve. The Ord Catchment is resource rich and the subject of significant mineral exploration. Halls Creek at the head of the Ord River is known for its historical gold mining. The nearest gold mines in production now are to the south west of the catchment, south of Balgo Aboriginal Community. Panoramic Resources Savannah Nickel Mine, between Halls Creek and Warmun reached consistent production of 1 million tonnes per annum of ore that was shipped via Wyndham Port under contract to a Chinese Company. In 2016 production ceased due to a drop in global nickel prices, but could potentially resume in the future. The Argyle Diamond Mine 100km to the south of Kununurra is based on a carboniferous lamprorite pipe and was established as an open pit mine in 1986. In 2006 the decision was made by Argyle Diamonds and its parent company, Rio Tinto to progress the Argyle Diamond Mine Underground (ADMU) project using a predominantly, automated block cave mining technique. The lifespan of the ADMU is expected to continue until 2021 and planning has commenced on the eventual final rehabilitation and use of the mine site. The Ridges Iron Ore Mine, 100km to the south of Kununurra, was in production between 2011 and 2015 and the iron ore was exported via Wyndham Port. Based on a long, narrow, shallow resource on top of the range, there is potential for further mining when global iron ore prices increase. The Sorby Hills silver, lead and nickel project, between the Goomig Farm Area and the Western Australian/Northern Territory border, despite gaining all approvals has not progressed to production, again due to current low global commodity prices. The Kimberley, including the Ord River Catchment, is a popular tourist destination amongst overseas and domestic tourists. Approximately 400,000 tourists visit the Kimberley each year, predominantly between April and September. A range of products are available based on the area’s landscape. The passage of the Ord through magnificent rugged ranges and contrasting savannah grasslands attracts visitors of all age groups. Eco tourism and Aboriginal tourism are both expanding. Scenic flights and boat trips on Lake Argyle, Lake Kununurra and the upper and lower Ord are available throughout the Dry Season and increasingly into the Wet Season. Caravanning and Camping are popular forms of accommodation, which come with their own environmental risks especially in terms of waste management and bushfires. The World Heritage listed Purnululu National Park in which the Bungle Bungle massif is located, lies at the head of the catchment to the north east of Halls Creek. The subject of two unresolved Native Title Claims, Purnululu is managed by the Department of Parks and Wildlife through the Purnululu Park Council whose membership includes Jaru and Kija representatives. Purnululu National Park is a renowned tourist destination and open to visitors throughout the Dry Season, except when bushfires necessitate closure. A limited number of Tour Operators, licensed by the Department of Parks and Wildlife offer fly-drive and camping accommodation, with organised tours in the Park. Scenic flights (helicopter and fixed wing), are operated by several air charter companies from Kununurra, Warmun and Halls Creek. Mirima National Park lies directly to the north east of the Kununurra township and includes eroded land forms similar to the beehive domes in Purnululu National Park. This park comprises a number of walks that are popular amongst residents and visitors alike. Barrbem (Zimmerman Range), to the east of Eight Mile Creek. Preparations for tourism have been progressed in one of the Conservation Areas, Ngamoowalem with basic picnic facilities and access tracks. The other conservation areas remain undeveloped. Downstream of the Mirriuwung Gajerrong Conservation Areas lies Parry’s Lagoon Nature Reserve a wetland area that dries into an extensive billabong during the dry season and is popular with tourists and ornithologists.